I’m all for cooking healthy food, but some of the best desserts combine a little from both worlds. Now, I can’t begin to attest that carrot cake is healthy. But it can’t be BAD with all those good ingredients in it, right? Help me out here! 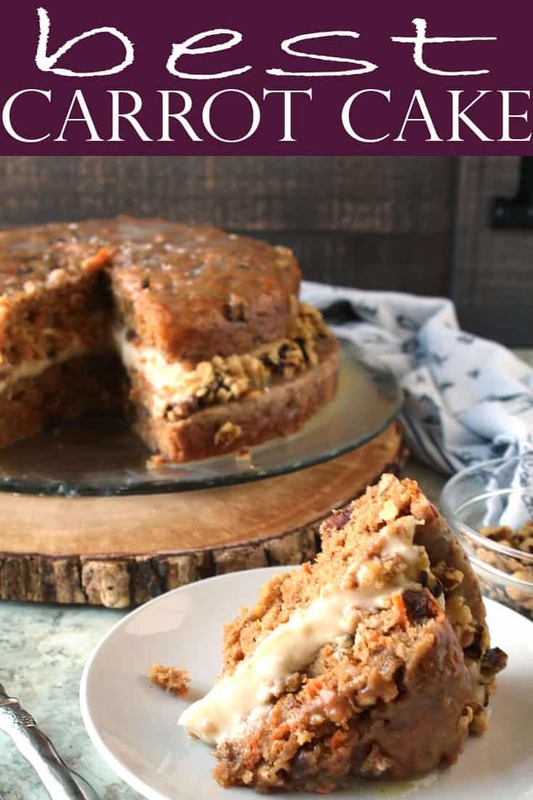 Why is it The Best Carrot Cake Recipe? 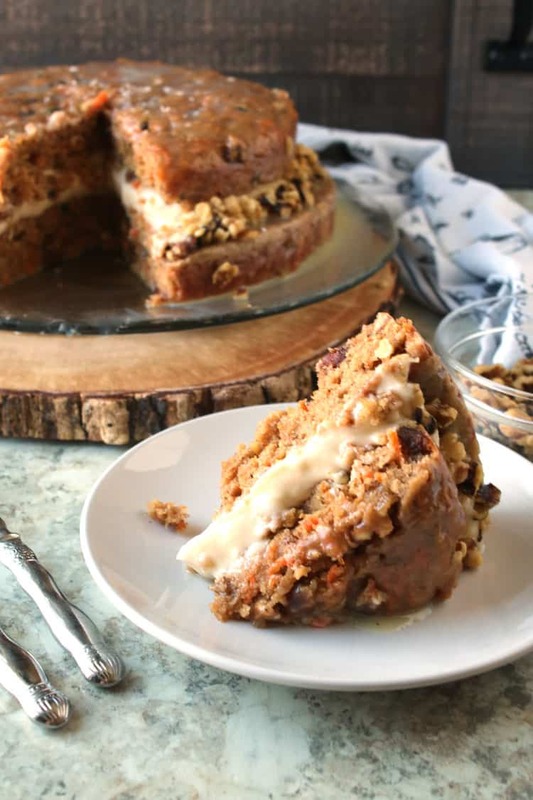 “Melt in your mouth” are the best words to describe this carrot cake creation. 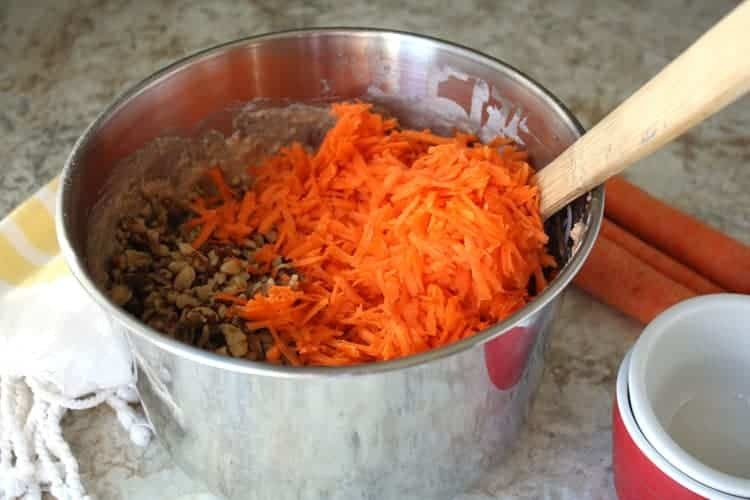 The Best Carrot Cake Recipe has the best (of course) of everything: carrots, dates, walnuts, and yes… even applesauce. Oh, and did I forget to mention that I love to top it with an out of this world White Chocolate Rum Ganache or Easy Cream Cheese Frosting? This is one of those types of cake that you’ll be tempted to eat for breakfast, lunch and dinner. It’s so moist and enjoyable. You’ll certainly want to savor each and every last bite. Be very careful not to gobble down this masterpiece, AND if you’re bringing this to a gathering — you might want to make sure to bring a few copies of the recipe. Friends and family are always asking for this recipe. 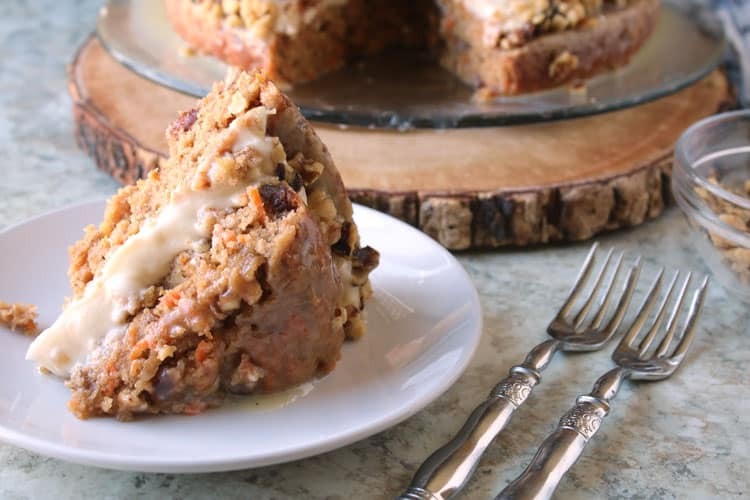 Have your cake and eat it too with The Best Carrot Cake Recipe! 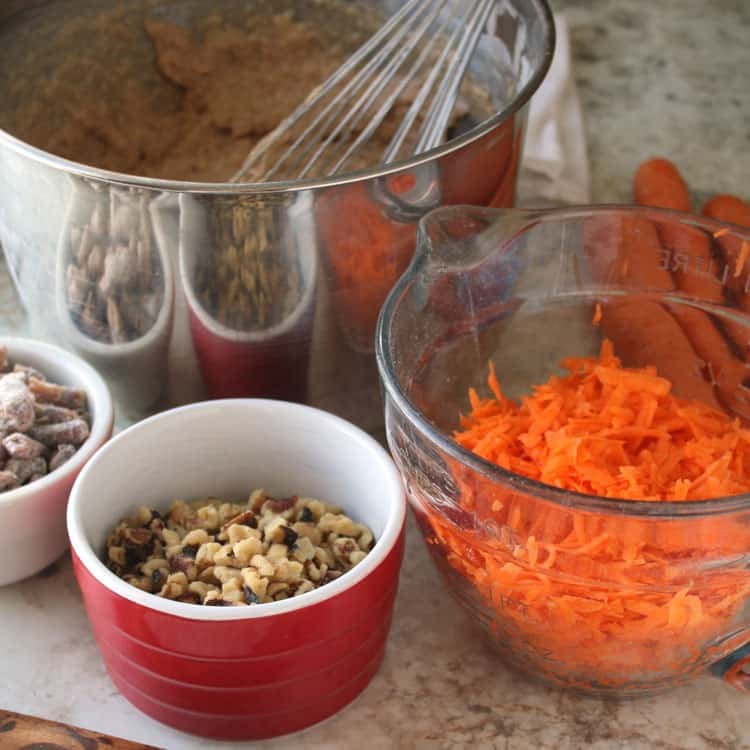 Let’s Make The Best Carrot Cake Ever! Start by preheating your oven to 350 degrees. Then, get out your wet ingredients: vegetable oil, applesauce, and eggs. 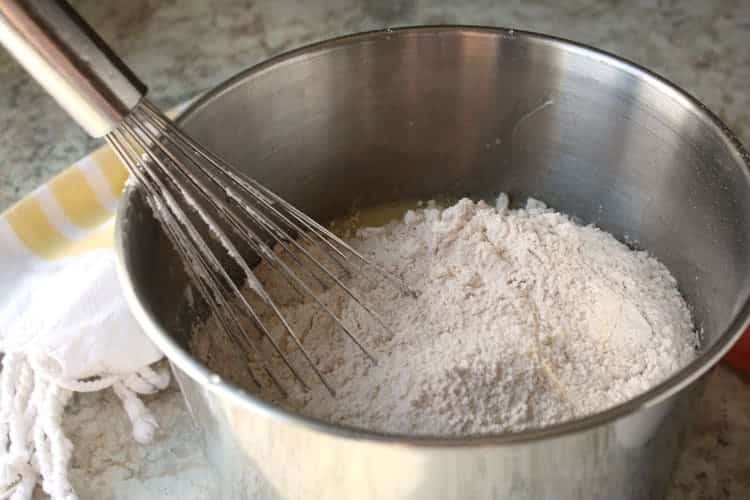 Now whisk ’em together until they’re well blended. 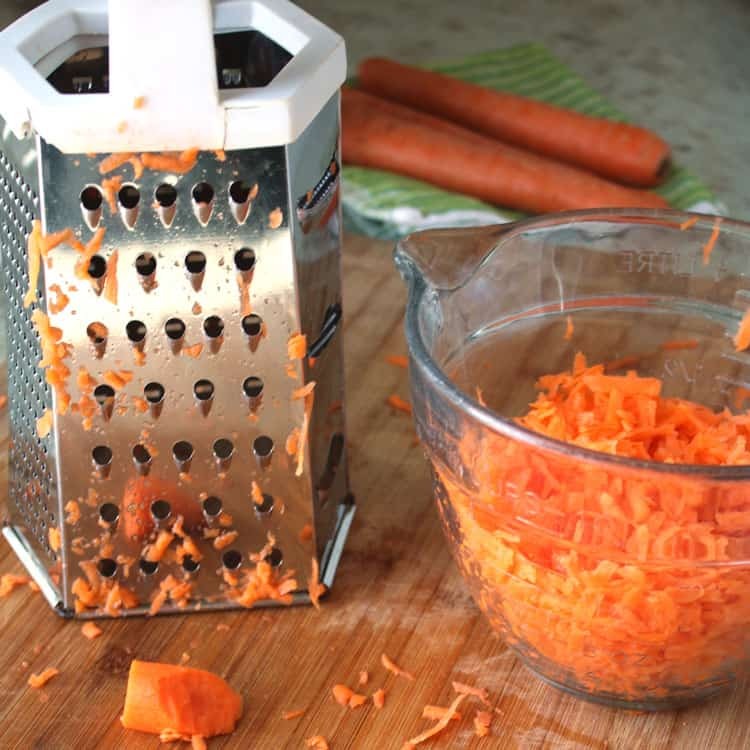 Now peel and grate your carrots. 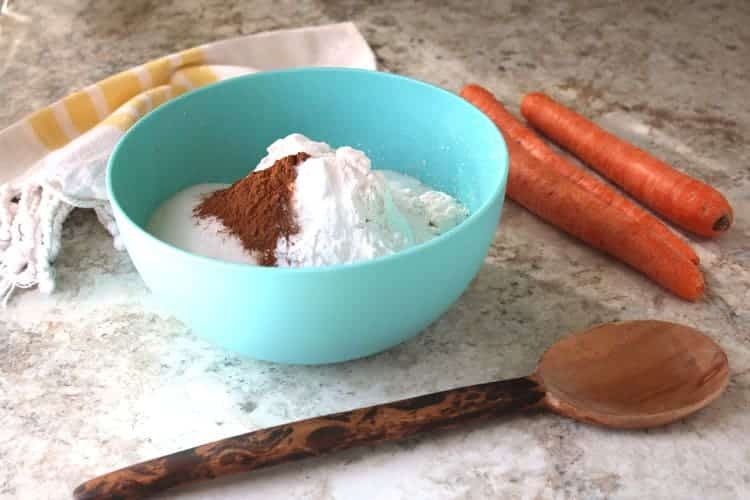 After grating the carrots, get out your dry ingredients: flour, sugar (you can use a little less if you prefer a carrot cake that isn’t quite as sweet), baking powder, baking soda, and cinnamon. Slowly pour the dry ingredients into the wet and stir until just mixed and free of lumps. 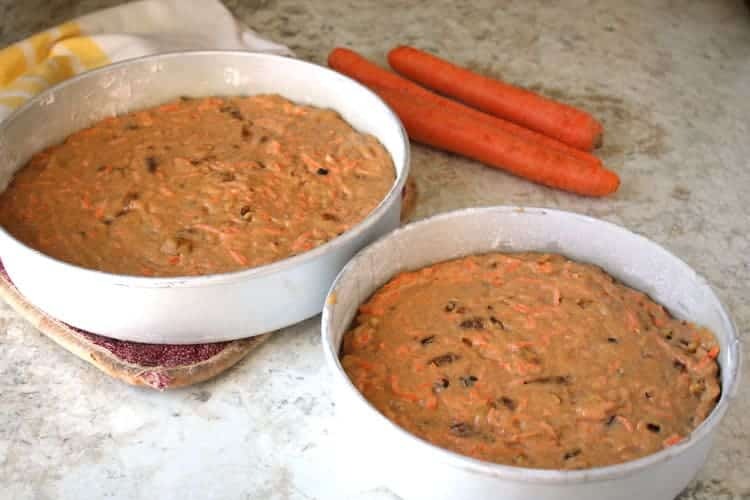 Assemble your remaining ingredients: carrots, dates, and walnuts. … and stir until they’re evenly dispersed. Now, spread your carrot cake batter evenly across two greased cake pans. Bake for 25-30 minutes, or until an inserted toothpick comes out clean. Enjoy the wonderful smells coming from your oven while your carrot cake is baking. The smell of carrot cake is unbeatable! Remove the cakes from the pans carefully by covering them with a plate and turning them over. Lift the pan up slowly to make sure the cake is not sticking to the pan. There you have it — The Best Carrot Cake Recipe! It really doesn’t get any better than this. Carrot Cake is good food, and this is the best carrot cake worldwide. More good-for-you ingredients and an easy cake recipe for homemade cake fun. Preheat oven to 350 degrees. Combine dry ingredients. 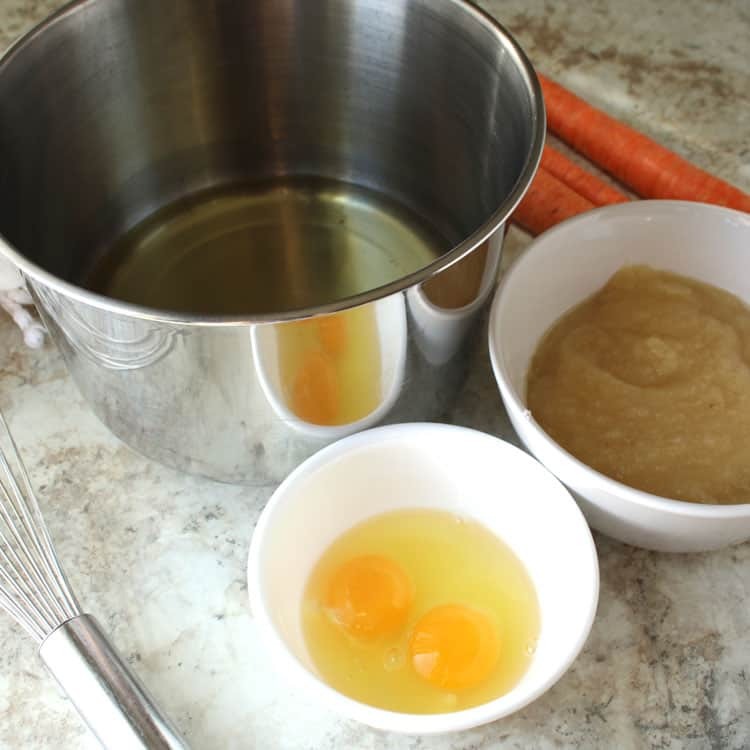 In a separate bowl, mix together oil, eggs, and applesauce until well blended. Slowly pour in the dry ingredients and stir until just mixed and lump free. 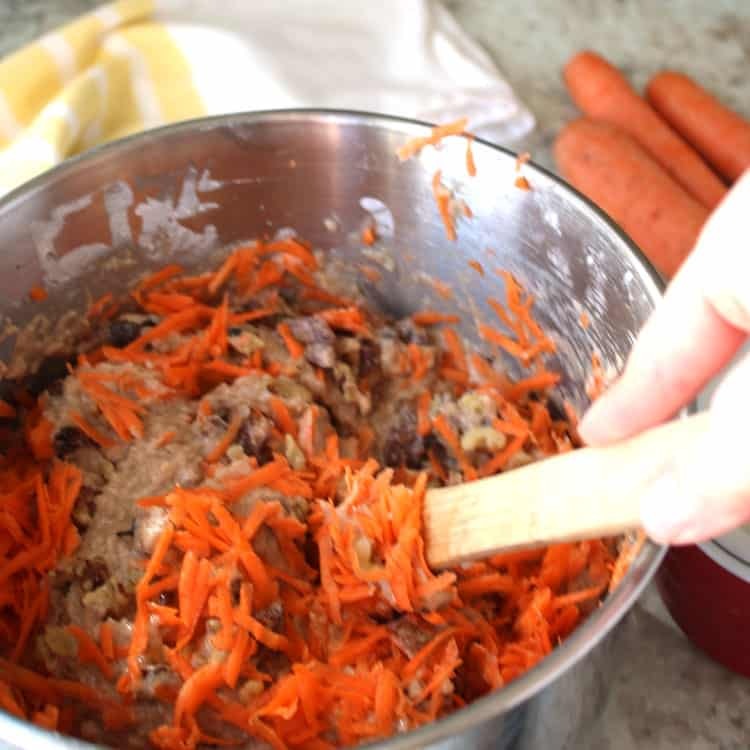 Add in the carrots, dates and walnuts and stir until evenly dispersed. 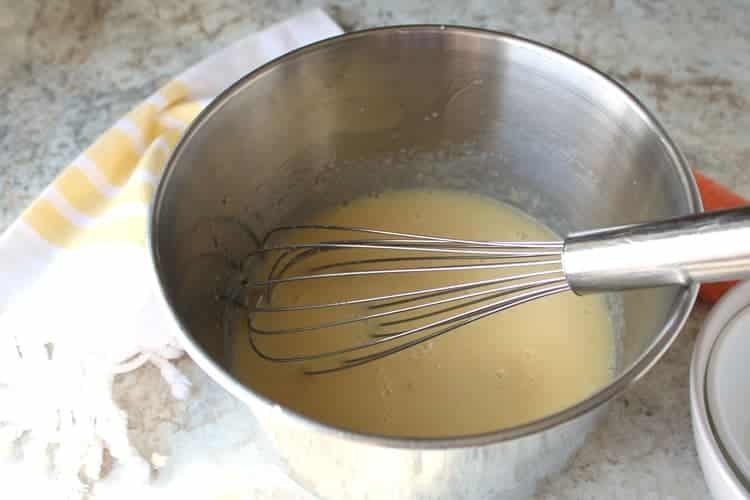 Grease two cake pans and pour in cake batter, making sure that it is spread out evenly. Bake for 25-30 minutes, or until an inserted toothpick comes out clean. Remove from cake pans carefully by covering with a plate and turning over. Lift the pan up slowly to make sure the cake is not sticking to the pan. Nutrition facts are calculated for cake only. I love carrot cake but I don’t think I’ve had any in probably 5 years . . . probably time to remedy that. Definitely will be saving this recipe. The cake in the picture looks delicious, — the recipe however says to put it in a bundt pan….. is the picture above made from this same recipe? I prefer the cake in layers. Is the layered cake as pictured in 8 or 9 inch pans? Thanks. We use 8 inch cake pans when we make the cake in layers. You can make it either way. I cant find the recipe? It’s there now! Not sure why it wasn’t showing up. Thanks for letting me know.